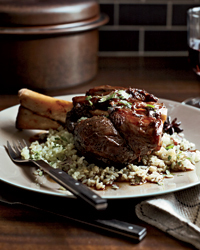 Wild-boar shanks are a great alternative to farmed pork. Johnny Monis braises them until tender in a fragrant broth loaded with garlic, star anise, cloves and cinnamon. Suggested Pairing: Robust, meaty Syrah from the Rhône’s Crozes-Hermitage region goes well with gamey meats like boar.